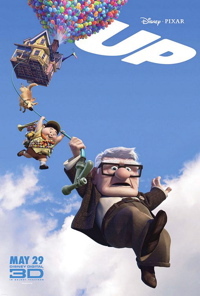 Pixar’s latest movie, Up, about 78-year-old Carl Fredricksen who goes on an adventure by attaching thousands of balloons to his house and floating away to South America, is amazing. The movie starts with Carl as a little kid watching a movie about his favorite hero Charles Muntz (a great adventurer). Carl wants to be like Muntz. Carl then meets a girl named Ellie who also happens to be a huge fan of Muntz. Then we see a brief montage of them getting married, buying a house, growing old together and then later we even see Ellie die. This had me and lots of the people in the theater crying. This sequence also contained a scene in which we learn that Ellie learns she can’t have kids. I’m pretty sure many of the kids who were watching the movie didn’t understand that part. Although it was a very unhappy scene, I thought that it did belong because it gives the movie a sense of reality, which brings teens and adults in as well. As Carl’s life goes on without his soul mate, he realizes that he never kept his promise to Ellie of going to Paradise Falls. So, he decides that he will move his house to Paradise Falls by using thousands of helium-filled balloons (he was a balloon salesman before retiring) to carry it there. While he is in the sky flying he notices an 8-year-old Wilderness Explorer named Russell tagging along for the trip. As they try to make it to Paradise Falls they go through an adventure filled with dogs that wear collars which allows them to have their thoughts spoken out loud and a big funny rare bird that loves chocolate, and the animation was excellent. Since seeing the movie, when I look up to the sky sometimes I feel like I can almost see Carl. I really like this movie because it is so emotional. Carl and Ellie’s love for each other reminds me of my grandparents. My grandma and grandpa have been together for so long and they always seem happy just like Ellie and Carl. Another powerful part is when Russell says that he wishes his father could be the one standing next to him when he receives his “assistance to the elderly” badge. Sadly though, Russell knows his father won’t be there because his father isn’t in his life. And the ending was awesome, especially the message—just being together is an adventure. For some reason, I don’t really want to see this movie. Okay old man. Ballons on the house. Random kid. Its too much, c’mon Pixar. I can pitch you a million movie ideas! but, I guess I’ll see it on DVD, i thought Wall-e was going to be stupid too, but I watched it (forcefully) and I loved it. Matter of fact, I’m gonna go watch Wall-e right now….